Discussion in 'Tutorials and How Tos' started by TFmaster, Sep 3, 2006. Enjoy. I explained it the best I could. If you have any further questions please ask them at the above link and I will do my best to provide pictures to better show what I did. Also, please fell free to post pics of your Mod if you follow this plan or alter it, here, so that others may be able to have additional options. Alright. Here's the best way I can tell you all what to do and the easiest way to go about it. First I would like to thank Gryph for his help in making these color coded diagrams. He put up with alot of my nip picking so please remember to thank him as well if you implement this onto one of your Alt Prime molds. 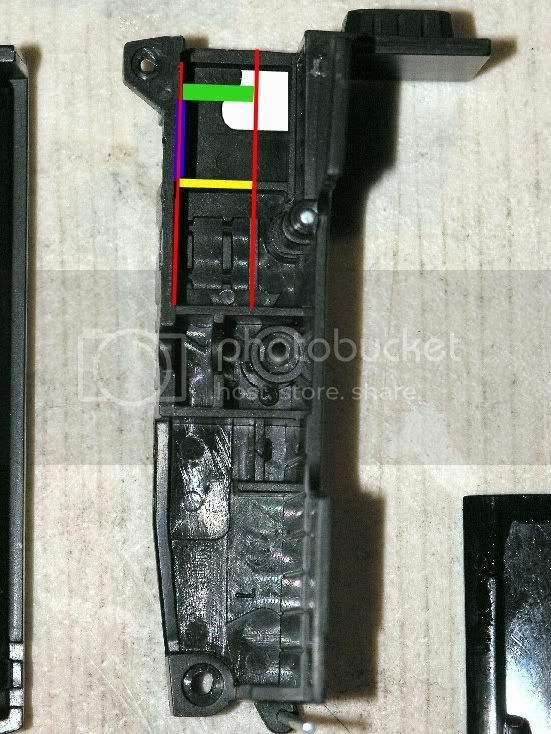 I also want to state that the diagrams are NOT measurement accurate to the T. Make sure when making your Lock lines (Green) that you hold your thigh pieces flush under the top stop piece and mark your lines for when you make your clip grooves. Now onto the color coding and what they represent. Yellow: Stop Walls that need to be cut or broken out so that the track will be able to move forward freely. Blue: The side Areas that have raised surfaces that need to be sanded down with a sanding tool of some type or Dremel or cut out/off with a Scalpel. Green:This is the area you need to make grooves in to allow the legs to lock into place. Purple: This is a part of the wheel well details that are located on the inside of the legs halves you see Below. It is also the area you need to fill up to with resin or epoxy. Just make it flush with the Tracks line without overfilling. Doing so will fill in the track lines and you don't want that as your legs will not clip back down into place in vehicular mode. Grey: This area is the only one that is a bit different then the rest due to it being the area that the other leg plugs into when Transforming into vehicular mode.You will need to sand down and smooth out with a dremel or cut off with a scalpel so you can refill it in flush and flat with the rest of that area so you can add your clip groove lines. In the picture above you'll notice it too is a bit different in the white area. Just like the other white areas fill it with your substance of choice. It won't need much to fill it but make sure it's flush and flat with the rest of it's surrounding area. I want to thank Gryph for his help in doing this diagram for you people. If there is any further questions please fell free to ask them here and I will do my best to provide pictures that will help further explain what is needed to do. I did take step by step pictures all day just in case but this should make it easy for you to do with just the diagram. Once you take your legs apart I'm sure you'll understand what I explained without further need of more explanations. Once you are done with all of this make sure that the White area one the opposite side of the Slide tracks (Other side of the red line) has some sort of filling to make a Wall so when you slide the legs out it'll hold it well in place. You will need to build this wall yourself as there isn't one there until you do. hope it helps and please fell free to show off your mods once your done and mention any chances that you did different then I so that others can have additional options. Oh, in the pics you see of the final product you'll see alot of white. I used Styrene pieces or sheets to finish mine. Enjoy!! 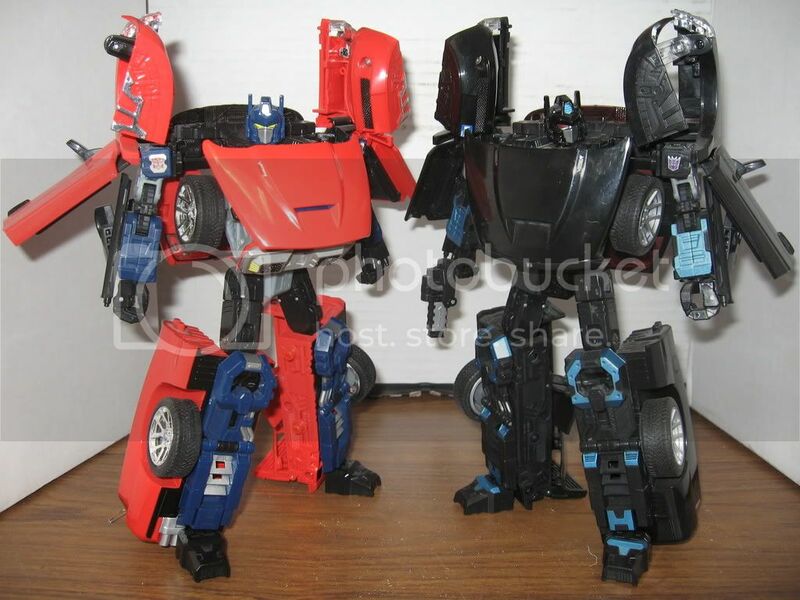 I have done 4 Prime molds all the same and none have given me problems. Each modification to each mold took about 1-2 hrs. After while of doing this it just gets easier and takes alot less time. A pro should be able to do one Prime Mod within 1/2 an hour. Red - outlines the track area in which the legs slide up and down when you collapse or extend the legs during transformation. Green - This is where you make a shallow groove so the tabs will grab and support the body when it is standing up. Yellow - This is a ridge that keeps you from extending the legs further, it needs shaved off. Grey - this is a post sticking up that allows you to peg the two legs together to form the truck mode, you have to shave this down. Blue - This is the side-wall of the track area and has to be slightly trimmed to allow the legs to extend further. Pink - This is the end of the wheel-well, and is just there to help illustrate where you're working. This mod is actually really simple. By trimming where the yellow line is, you're opening up the track area that allows the legs to slide in and out. As it is, the leg only extends until this point, and you are wanting to go farther than this. So, grind that down until its flush with the rest of the lower track area. Then, you want to grind on the sidewalls so that they become just as wide as the lower track area where the blue is. Once you have this accomplished, then you want to fill in all of the cut-out area at the upper end of the track so that it will be raised and flush with the lower-track area. You also will need to fill this area in on the side to give it another sidewall of support to keep the legs from being horribly floppy. You can do this by cutting up a piece of styrene to fit the shapes and adhereing it, or you can also use putty or epoxy. Now you're at the last step. Where you see the green line in the images, you want to make yourself a shallow groove. 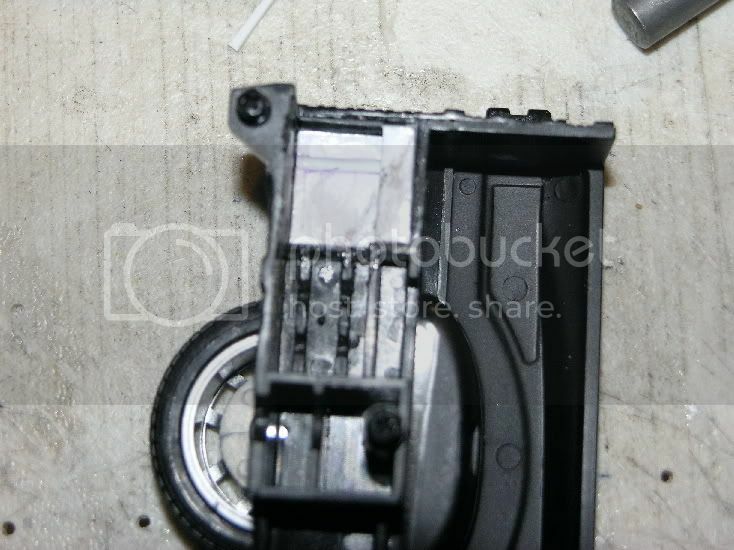 If you look at the lower track area, there are a couple sets of notches molded in there where the bottom of the knee joint of the thighs can click into place via its built-in springs. 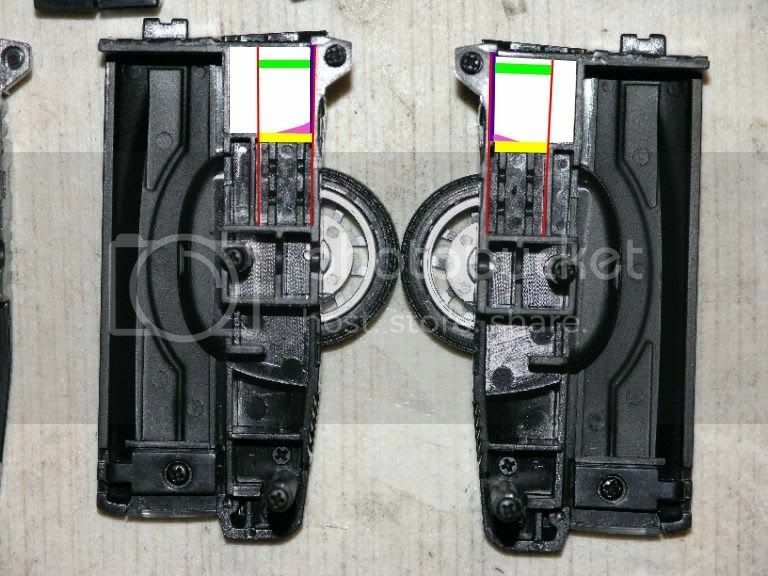 we need to make this groove on the green line so that after you've extended the legs all the way out, they will still have a place to click into place so that the alternator will still stand up. If you don't, it will just collapse back down to its original height. Just go by the pre-made grooves, you can see it doesn't need to be deep or large or anything. to best position your grooves, especially to make sure he stands up evenly, take one of the thigh pieces and rest it against your shin piece to get the best idea of where you want to cut your shallow groove. 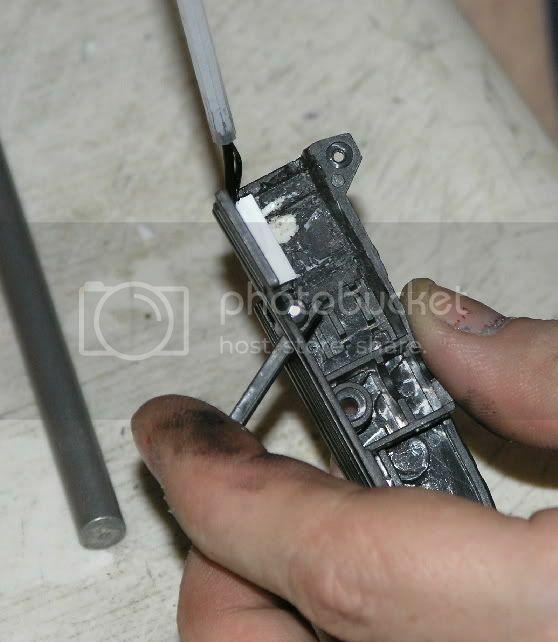 Once you've made your groove you should be able to screw the legs back together and be finished with it. When you go to extend the legs, you'll feel it click into place at its normal spot, then just keep pulling until it slides out the rest of the way and clicks yet again. **As far as the flap piece on the back of the leg that is the truck bed- you don't have to do anything to this, but you do have the option of gluing this piece in its upright and seated position as it will now serve no purpose at all. REDLINE- There's also a mod out there that makes the thighs look longer and the shins look shorter, but you're not actually changing the length of anything. I've seen it done by several people, but the one for-sure name that comes to mind is sodawilly. He used this mod for his Inferno and Grapple customs. 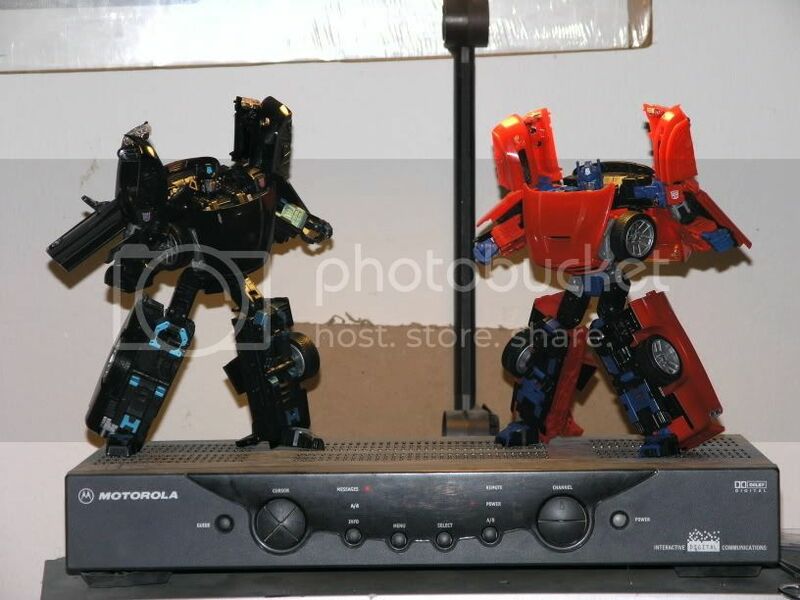 I didn't see any info on these anywhere, but I figured it out easily enough just looking at his images in our gallery to use on my Longhaul. I figured I would add this info the the leg tutorials thread for anyone else who might want to do this mod. This is a very simple mod, and all you need to complete it is 1) hobby saw or knife, and 2) screwdriver (precision Phillips-head). First, take the three (3) screws out of one of the shins. Now, pull the two halves apart. Put one of the halves back on to the thigh so you can see where the knee joint sits. You should notice that there are only two (2) cuts to make per leg. On the outer shin half, the flap on the bed side does all we need it to do. So, we only need to cut a small square off the front of the leg. On the inner shin half is where the larger cut has to be made. Basically, looking from the bed side of the inner shin half, you can see that the cut-away that the rear knee flap sits in is narrower at the bottom than the top. In fact, the upper section of this cut-away goes all the way to the edge of the leg half. Where the narrow and the wide portions of the cut-away meet is where we make our first cut. 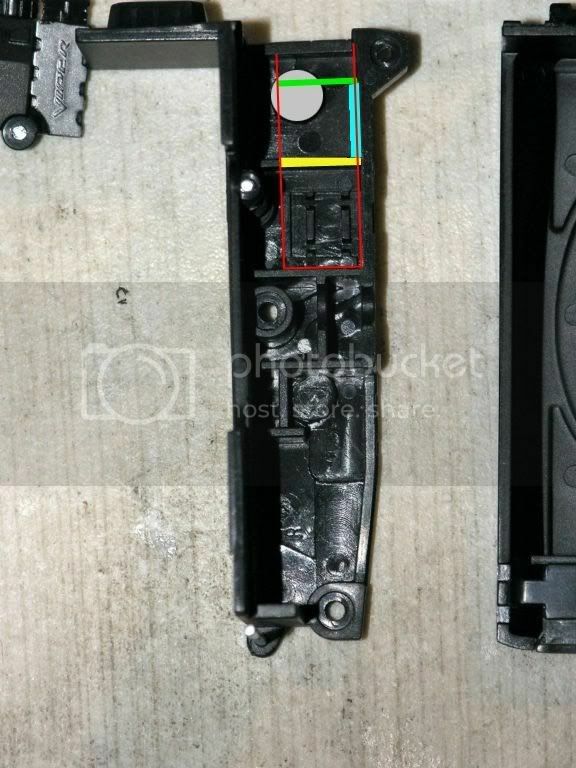 Looking at the part from the inside, you'll see a molded line right about this same point. Use the two as your guide to cut the inner side of the inner leg half. Now, from the place your blade broke through the front of the leg piece, cut across the front of the inner shin piece, parallel with those round "tube" molded details until you've cut to the end. Your cut should be just under the middle of the bottom two (2) "tubes". Now hold the outer shin half together with the inner shin half and make a mark (pen or pencil) on the front side where your second cut is on the inner half piece. Now, holding just the outer piece, make a cut from the rear (bed side) using the front of the bed (back top of leg) as your guide to cut down the front of the shin piece. Stop when you reach your mark, and then cut across the front of this piece along the mark you made earlier. That's it! Just repeat this process for the other leg. It's a really simple mod, only taking you a few minutes to accomplish. OPTIONAL: If you want the front of the shins to still be the front of the robot, you can optionally cut across the top of the shin-guard (the rotating piece that folds in half) so that it stops flush with your new cut. Another advantage to this mod is not only the new leg look, but yet ANOTHER leg option: you can trim down the front top of the kneecap so that it's round like the rear of the kneecap piece so that you can bend it in either direction, and then you can simply do a waist twist to have the BACK of the legs be the FRONT!